The Colorado Springs Chess Club (CSCC) meets Tuesday evenings, starting around 7:00 p.m. with the main event (see schedule) at 8:00, at the Acacia Apartments Building at Platte & Tejon, just north of Acacia Park. Club officers are Dean Brown, Richard (Buck) Buchanan, and Renae Delaware. For more information call Buck at (719) 685-1984. As an affiliate of the United States Chess Federation(USCF), the Colorado Springs Chess Club sponsors three major weekend tournaments each year: the Colorado Springs Open in early March, the Pikes Peak Open in early August, and the Winter Springs Open in early December. See games from the 2007 Pikes Peak Open here. 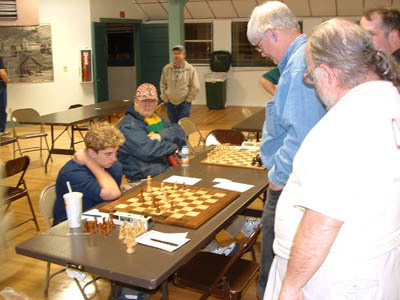 See games from the 2007 Winter Springs Open here. Hey - Want to play chess against your own computer right now? Click here. Please be sure to visit the superb Colorado State Chess Association(CSCA) website. This comprehensive site will tell you everything you need to know about clubs and tournaments throughout the state. Other useful websites are New Mexico Chess Organization, and the Wyoming Chess Association.